If you're one looking to ruin everything Apple worked hard for in designing the iPhone 5 using breakthrough aluminum unibody and glass construction, then this is the type of hot 90s mod you won't want to pass up. iPhone5Mod is selling the most thorough translucent mod kit every made for the iPhone. The DIY mod transforms the entire rear body assembly including the sides, top and bottom portions of the iPhone 5 as well as all the small details and parts like the volume/power buttons, micro-SIM card tray and speaker grille into a one-of-a-kind, translucent and dangerously flashy iPhone 5. 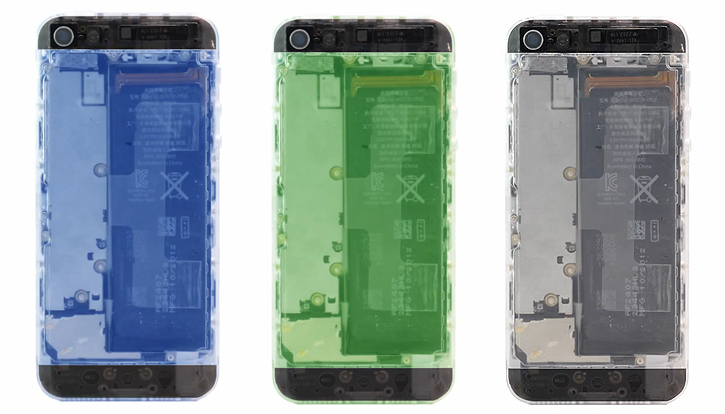 The rear see-thru body panel including the two glass replacement parts can be customized in 7 different translucent colors so you could recreate that iconic two-tone iPhone 5 look in translucent color. How brilliant is that? Okay, now we're thinking about ditching the premium materials for transparent plastic. iPhone5Mod claims the mod is made using highly durable plastic which can withstand heavy use, a bit of bending and is actually scratch-proof (hard to believe) and anti-fingerprint. Sounds like a pretty good protective case alternative. The $40 kit includes a complete rear body panel in your choice of color and for a limited time, you'll get two sets of detachable top and bottom pieces in all 7 colors so you can mix and match your favorite color combination. You'll be able to purchase those separately as well. Unless you know your way around the iPhone 5, we don't recommend you try installing this translucent mod yourself. Not to mention this will void your warranty unless you revert the process. Video after the break!